Our dishwasher started leaking a while back and we just haven't had a chance to get it taken care of so I've been washing dishes by hand in the mean time. So after spending the time getting the dishes done and the kitchen scrubbed I went upstairs to take a shower. Shortly later, Brian calls up to me to tell me I need to come see this. Imagine my surprise to see EVERY dish in the kids cupboard (minus the plates since they don't hold liquid well) out on the table. Most of them were full of water courtesy of the fridge dispenser. Before I could get too upset, Brian asked them why they had all the dishes out. They told us that they were the bears and had to find the food that was just right. 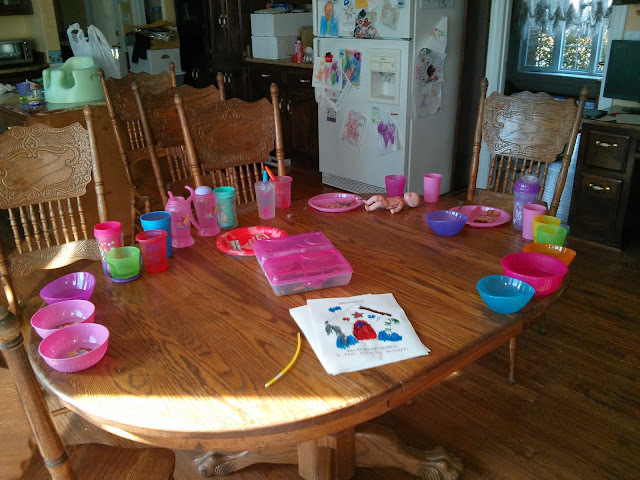 Whats a few more dishes to wash if my kids can have such a great imagination!